Of the scores of new superheroes introduced during the 1990s, Michael Dalton Allred’s Madman is one of the hippest and most stylish. Rendered in a simple yet expressive manner— running decidedly counter to the stoic, over-embellished, and exaggeratedly muscular style that became endemic to mainstream superhero comics—Madman’s premiere issue (Madman #1, Tundra, 1992) gave the world its first glimpse of Frank Einstein, the man behind the mask of Madman. Allred’s creation, beautifully colored by his wife Laura, was one of the first superheroes designed for the ironic sensibilities of twenty-something postmodern comics readers—an audience that would undoubtedly show little interest in standard superhero fare. Reanimated after death by Dr. Egon Boiffard and Dr. Gillespie Flem, a pair of mad scientists worthy of inclusion in the cast of Buckaroo Banzai, the man destined to become Madman awakens with almost no memories. Unable to recall his real identity, he adopts the name Frank Einstein (which sounds a little like “Frankenstein” if spoken too quickly); he also finds himself gifted with unpredictable psychic powers (including prophetic dreams and an intermittent sense of danger or security that Einstein describes as “spiritual inner eye awareness”), heightened agility, an apparently instinctual ability to survive being attacked, and an irrational hatred for beatniks. Clearly, Einstein’s life isn’t as simple as that of most mainstream superheroes. For starters, he is full of unanswered (and perhaps unanswerable) questions about his identity prior to his death. And being a reanimated corpse, he is rather unattractive. Einstein’s personal insecurities and neuroses drive him to garb himself in a pajama-like white costume with a red lightning bolt/exclamation point motif; the outfit includes a white mask, intended for vanity’s sake rather than for the protection of a secret identity. Despite his extraordinary abilities and his mask—worn only to bolster Madman’s poor self-esteem—Einstein does not think of himself as a superhero. Immediately dubbed “the Madman of Snap City” because of his weird, corpselike appearance and his strange turns of phrase (fairly typical of Einstein are such utterances as “Meanies never win. And you can quote me on that.”), Einstein finds himself regularly squaring off against rogue robots, late-show monsters (including a vomit-beast known as the Puke), and crazed beatniks, with a little help from gal-pal Joe and an alien called Mott (a native of the planet Hoople, a reference to one of Allred’s favorite 1970s bands). Unlike virtually anyone else in the superhero trade, his signature weapons include a hollowed-out, lead-filled Duncan yo-yo and a slingshot, lending a fair amount of credence to the “Madman” moniker. After producing six issues of Madman in a 1992 series for small-press publishers Tundra and Kitchen Sink (winning the 1993 Harvey Award for Best New Series), and three issues of Madman Adventures for Tundra in 1993, Allred took his concept to Dark Horse Comics, a haven for creator-owned properties since its founding in 1985. Dark Horse furnished Allred’s stylishly bizarre hero with a much larger audience than ever before with a new series, Madman Comics, which debuted in 1994. 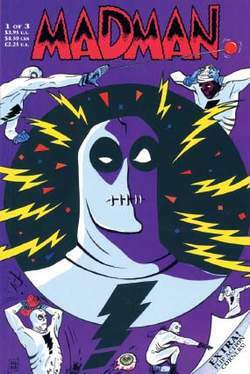 Madman’s new outing was well received despite frequent and lengthy lapses between issues, especially toward the end of its twenty-issue run (December 2000). Madman teamed up—and briefly switched bodies— with DC Comics’ Superman in Superman/Madman Hullabaloo!, a three-issue miniseries released in 1997. Two years later, Dark Horse released Madman/The Jam, a two-issue miniseries that paired Allred and his character with another postmodern hero (with the participation of Bernie Mireault, the Jam’s creator). After nearly dying at Monstadt’s hands in the horror-detective yarn presented in Madman Comics: The G-Men from Hell (four issues, 2000), Madman became part of Snap City’s first superhero group in The Atomics (AAA Pop Comics, 2000). Allred wrote and drew this title with obvious affection for the Silver Age (1956–1969) artistic powerhouse Jack Kirby, though filtered through a postmodern, somewhat tongue-in-cheek lens. In The Atomics, Madman finally makes peace with the beatniks he has fought over the years, and helps change several of them from alien spore-infected mutants into a fledgling team of mismatched heroes, nostalgically reminiscent of early issues of Marvel Comics’ Fantastic Four or Avengers. Among Madman’s new super-companions are the stretchable Mister Gum (better known by Snap City’s populace, unfortunately, as the Booger), the Slug (a purple mutant with protuberant eyestalks), the Iron Man-like Metalman, and the enigmatic and acne-afflicted teenage time-traveler known as Zap-Man. The Atomics concluded its run in 2001 after fifteen issues. Walt concluded with this: "[T]here is little or no evidence that the madman theory of diplomacy actually works. Hardy Boys Adventures: The Madman of Black Bear Mountain is the twelfth book in a new series of adventures for young adults featuring the classic, adventure-loving, mystery-solving Hardy Boys in a modern-day setting. Tonight at the Social Space Kaymakkin in the capital you can catch actor Marios Ioannou as he retells the story of a Diary of a Madman based on the short story by Gogol Nikolai. He considers himself a kind of madman, not because he is out of his mind, but because he is too lucid. Like Poe's madman, Parker is an unreliable -- and creepy -- narrator from the start, but Rizza conveys his perspective eloquently and consistently, half convincing the reader that maybe he's right. In this article we explore the role of Madman Entertainment, and by implication the role of specialist distribution companies more broadly, in the sustenance of fan cultures and Australian investment in global popular culture. Gooder, who offers Michael Caine starrer "Harry Brown" as a highlight for them this year, feels auds may be tempted away to ancillary markets, but he also notes strong support for local films, a point underlined by James Hewison of Madman Films, which had local hit with David Michod-helmed "Animal Kingdom. Featuring a new and exclusive documentary, Madman Across The Water - The Making Of Elton John, the night also includes Elton John - BBC Radio 2 Electric Prom recorded earlier in the month and finishes with Elton John At The BBC, a compilation of archives documenting the star's career. THE funeral of shotgun madman Raoul Moat will be held on Monday. They rightly offer kind words of comfort to the bereaved and justifiably condemn the actions of madman. Melchor de Santa Cruz includes the story of the dog and the madman in a list of jokes about madmen and the source for his jokes, as the title of his book makes clear, were jokes from popular sources.